Lurch taking part in a "punch hunt"
Broke exhaust trying to do the first punch, these are punches 4, 5, and 6 - there were more but I have only put this amount of video together. Okay, might have the time line a bit out here. The punch hunt happened a couple of weekends ago. I broke the exhaust pipe trying to do the first punch when I caught the silencer on a bit of tree stump. 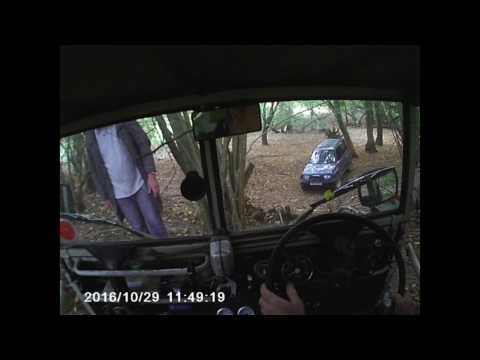 I then drove round for the rest of the day with the broken exhaust - the video would have that sound on it had I not forgotten to take the camera out of it's waterproof case! I then asked around about replacement exhaust pipes and came to the conclusion that it would be cheaper for me to produce my own, hence the pictures and short write up in the other thread. I'll see if i can get a link to the piece of video of me taking part in the night trial section on that weekend - Some one claims it was a two stroke Haf part way through the video. I, again messed up on one of the gate and cut it too close, knocking one of the gate sticks! Oh well, I might get better at them as time goes on!